Postnatal Physiotherapy and integrated functional fitness for new mums. What is a Mummy MOT®? The MummyMOT® is a detailed postnatal physiotherapy assessment of the abdominal and pelvic area. It will check your posture, breathing, tummy gap and pelvic floor strength. exercise programme will be prescribed. The Mummy MOT System combines the principles of Physiotherapy assessment with the practice of functional retraining. Following delivery postural changes, muscle imbalances and altered alignment occur and persist. It is essential to correct and rebalance otherwise pain, prolapse, urinary incontinence or rectus diastasis will persist. Left untreated, how can Mums return to daily functionally activities safely. Mums need to bend, lift, squat, twist. The MummyMOT identifies muscle imbalances through the assessment and the restorative exercise programme corrects them, regaining stability and allowing optimal function. The System uses Swiss balls, rollers and theraband to help activate the important stabilising muscles. Proprioception and breath work are incorporated. 100% Focus and Working purposefully on the out breath. 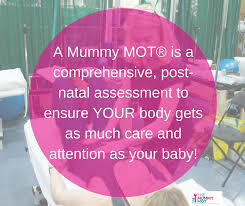 Who needs a Mummy MOT®? Most women after having had a baby, have a weakness in either the tummy or pelvic floor, which then creates instability and poor core strength. The result causes back pain, pelvic pain, bladder and bowel weakness . To avoid any long term childbirth related complaints come early and get your tummy gap and pelvic floor tested – then start an optimal postnatal recovery programme. appointment when we can support you in this way. Bespoke 1-1 Physiotherapy and Rehabilitation Packages also available following the Mummy MOT .